This page was intended to answer many of the common questions we receive about our dog training programs and our Atlanta dog trainer. That said, please don’t hesitate to contact us. We love to talk about dogs! Call us anytime at 678.358.0658. Do you work with all breeds? Do you turn away breeds like Rottweilers, Dobermans or any of the bully breeds? Sounds good, but I bet you’re expensive! What if I just want to address one behavior? Do you train attack or guard dogs? My last dog trainer was kind of condescending. Is that what I can expect from you? I live in the Atlanta area. Who would be my dog trainer? You look young. How is it possible that you can handle such serious behavior problems? Do you train with treats? Do you work with all breeds? Do you turn away any breeds like Rottweilers, Dobermans, or any of the bully breeds? I work with all breeds, no exceptions. I have worked with dogs of all sizes and temperaments, so don’t be worried about your dog being too much for me to handle. Back in my days working at a doggy daycare, I had the one of the most hyper and biggest Great Dane lovingly tackle me, and I survived! I also am huge fan of Rottweilers and grew up with them. Regarding “aggressive breeds” or “bully breeds”: to me, no breed is worse than the other and I certainly do not believe or enforce what I like to call, “doggie prejudice”. You bet! Puppy training programs are completed in-home because they’re designed to teach you how to develop a good relationship with your puppy from the get-go, and to help your puppy learn all this new, vital information in a familiar and comfortable environment. The dog’s relationship to his/her family as well as his/her lifestyle at home are the two most important factors influencing a dog’s behavior. Knowing this, my puppy training programs are designed to teach you how to handle these factors the right way so that you have the best chance of avoiding behavior problems in the future. Of course, other typical puppy issues are covered, such as housebreaking, basic commands, etc. I cover the entire Atlanta area, including Grant Park, Midtown, Buckhead, Castleberry Hill, Tucker, Inman Park, Decatur, and more. I also visit outer cities/towns like Smyrna, Norcross, Jonesboro, Alpharetta, Dunwoody, Marietta, and many other places. If I can get to you in less than 75 minutes, you’re in my range. Call me if you’re not sure – I’ll be honest, and I am always willing to discuss negotiations! Because I provide in-home dog training, I mostly travel all over the place for my clients. While I do not have a shop or “base” for my business, my home office is based out of Grant Park. I love my neighborhood and my dog loves it since we’re right by the park and Zoo Atlanta! I am also a member of Southeast Atlanta Business Association, a great network of local business owners in SE Atlanta! I’m sure a lot of people may assume so, but I wouldn’t say that. My training creates long-lasting results and is commitment-based, which means instead of nickel and diming you for lesson after lesson after lesson (to continue indefinitely), I charge just one flat fee upfront, and I commit to working with you until we reach our training goals, which we set during our consultation. We get the money out of the way, consequently allowing more concentration on the actual training and betterment of your dog. If you’re pricing dog training services, click here for a very thorough rundown on the cost of professional dog training. While that one issue may be the most critical issue, I would caution you against that line of thinking. In order to create lasting behavior change, dog behavior needs to be addressed as a whole. Check out this article for a full explanation of just how dangerous spot-check dog training can be. I am a firm believer in finding the root of the problem and covering all the bases of the dog’s behavior to prevent anxiety, exacerbating bad behavior, and possibly creating new behavioral problems. Do you train guard or attack dogs? No. My training addresses behavioral issues such as poor manners, anxiety, aggression (all types, including dog and human aggression), housebreaking, hyperactivity, lack of focus/recall, etc. While taking into consideration the family’s schedule and needs, I offer the dog a behavior that will bring more harmony to the mind and household – both for human and canine! While I do not hold it against anyone that is seeking a guard dog, I consider basic obedience, behavior modification, and aggression rehabilitation my primary specialties. No way, no how! I love dogs but I do love people as well! I tend to build deep relationships with my clients and their dogs, and I certainly do not judge them on their lifestyle or past mistakes. There are lots of skilled dog trainers out there, but I do believe that what makes a successful dog trainer is their ability to reach both the dogs and the people. That’s my utmost priority because it’s hard for the dog to change his/her behavior over the long-term if his/her family isn’t on board, both physically and emotionally. I will always try to help and make sure my clients fully understand the training program and what they are doing, but I will NEVER look down on anyone for asking questions or needing extra help. We all work together as a team, and I am always a phone call or e-mail away if a client has questions or is struggling with the training. That would be me, Christina Dore. 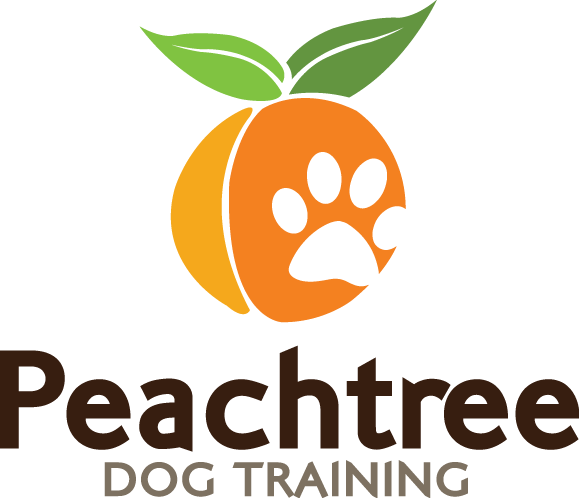 I’m the owner and dog behavior trainer of Peachtree Dog Training. I am the sole trainer here at Peachtree and I am lucky to be one of those people that loves their job! Click here for my full bio, and feel free to visit my blog and Facebook! Thanks for the compliment (I think?) but age really has little to do with it. I’ve had the privilege of studying with some of the most skilled dog trainers in the country, and the training protocol I follow has over 26 years of success behind it. My age certainly does not affect my ability to train your dog and work with you professionally. Also, I may not be as young as you think! Sometimes. I think treats can be helpful to teach a brand new behavior, but I always encourage never to fully rely on using treats. Praise and other forms of reward (you can never wrong with pure love, accompanied by a nice belly rub!) are always great for a dog and I think that builds a more intimate communication and more solid connection with the dog. With treats, I most frequently use them when a dog is totally clueless with their commands, such as ‘sit’ or ‘down’. No. I am affiliated with Canine Trade Group, a national network of professional dog trainers, but I don’t answer to them, or to anyone. I am solely owned and operated, but I am extremely grateful and proud to be a part of CTG. I work with an excellent staff and network of dog trainers that are committed to the same standards of professionalism, ethics, and positive results. I use an approach that has proven to be successful, yet I consistently seek the input, advice and opinions of my CTG peers and mentors. We all work closely and learn a lot together through our experiences with our clients, their dogs, veterinarians, and so forth. My Rottweiler dog passed away recently, so I am holding off on a new dog, especially since I am buying a home soon and want to have a yard ready for a new dog! I love all dogs but I am a big fan of Rottweilers and big breeds! Once I become a homeowner with a spacious backyard, I will foster and be a dog mother again soon and then spam everyone with adorable pictures of them! If you do not see your question here, please do not hesitate to give us a call at 678.358.0658. Our behavioral specialist are available to speak with you about your dog from 9am through 5pm on Monday through Friday.